« Another Hot Day On The Water! So far, all the lakes are holding steady. At 6:30 a.m. today, Beaver was at 1129.36, Bull Shoals at 693.18 and Table Rock at 928.61. The past couple days, they have only turned on three generators most of the day, with the tailwater level running 706 to 707 feet plus or minus. Flow has been as low as 4500 cfs to around 8000 cfs. Big change from five days ago. With this low of water, we are all noticing some definite changes to the relocation of the river bottom. It will be interesting to see the river when the generators finally go off. Friday and Saturday were down right chilly. Somewhere in the 50s, overcast and windy! Today will be in the upper 50s and sunny. Looks like sunny Monday and Tuesday with temps in the upper 60s, Wednesday and Thursday are predicted to be partly cloudy and in the low to mid 70s. By the weekend, Friday and Saturday there is a chance of scattered thunder storms and temperatures in the upper 70s to lower 80s. Carolyn out Friday with Wanda and Joanna Friday. Had a pretty good half day catching on the ruby midge with the red tunghead dropper. The red San Juan dropper also worked well. Joanna, aka “no beachballs” (inside joke) also caught a few stripping the silver bullet and holographic green cracklebacks. Stan had Doc and Terry, from Oklahoma out all day. They did well on the holographic green crackleback and the ruby and red midge combination. 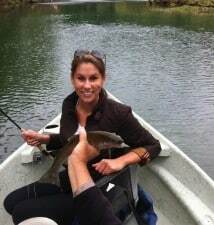 Yesterday, Stan introduced Mike’s daughter, Amanda to fly fishing. Mike, from Oklahoma, has fished with us several times. His daughter has moved to Branson and he came up to take care of flood damage and decided a fly fishing trip would be a good diversion as well as a chance to fish with Amanda. She is a quick learner and caught several fish. Pretty much the same patterns as Stan used on Friday. This entry was posted on Sunday, May 15th, 2011 at 9:09 am	and is filed under Fishing Reports. You can follow any responses to this entry through the RSS 2.0 feed. You can leave a response, or trackback from your own site.